How do I process an EFT transaction? Cashbook provides a method of producing a file of transactions for direct crediting to payee bank accounts via internet banking software.Relevant transactions must be marked by clicking the EFT checkbox in the transaction entry screen.. Entered Your bank account/EFT Details in Cashbook. Click on the link: Setup Your Bank Account Details for EFT Processing. Entered bank account/EFT Details for each supplier in Cashbook. Click on the link: Setup Supplier Account Details for EFT Processing. 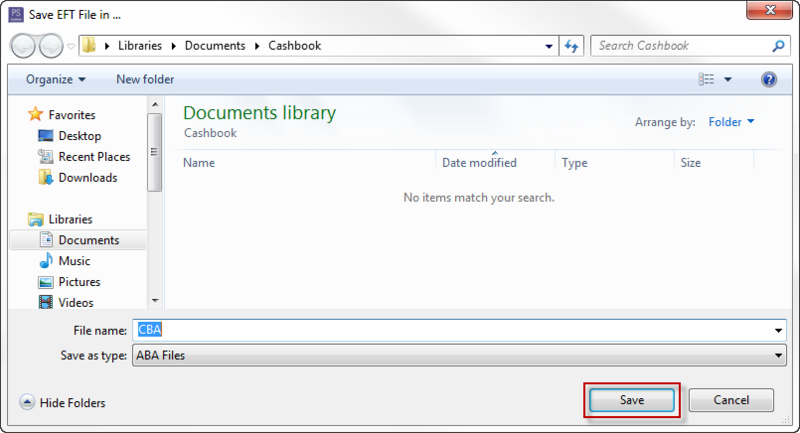 Entered bank account/EFT Details for each employee in Cashbook (if applicable). Click on the link: Setup Employee Bank Account Details for EFT Processing. Entered all payment transactions you wish to be included in the electronic payment file. Click on the link Recording an EFT Transactions. Click on the Transactions > Process EFT menu option. This will display a list of all payments that have been marked as "EFT File" and have not yet been processed. Set the required date for the transactions to be processed by the bank in the Date to be processed by bank box. Tick the Mark processed transactions as cleared to bank statement check box at the bottom of the screen, if you wish to mark processed transactions as "cleared" for bank reconicliation purposes. Note: Payments with no tick will not be processed to the current file and will remain on the EFT list for later processing. To remove a payment from the EFT list (without processing it to an EFT file), tick (right click) the required transaction/s and click on the Remove Items From EFT List button and then click Yes to the confirm message. (Alternatively, go to the cashbook listing screen and edit the transaction and "untick" the EFT File checkbox, then click OK to save. Note: If a transaction needs to be re-processed for some reason (e.g. an invalid bank account number used), you will need to go to the cashbook listing screen and edit the transaction and clear the EFT checkbox and click OK to save. Now re-edit the transaction and re-set the EFT checkbox on - the transaction will now appear on the list of items for EFT processing. Save to an appropriate location. The electronic payment file can now be uploaded to your bank using your bank's online banking portal.